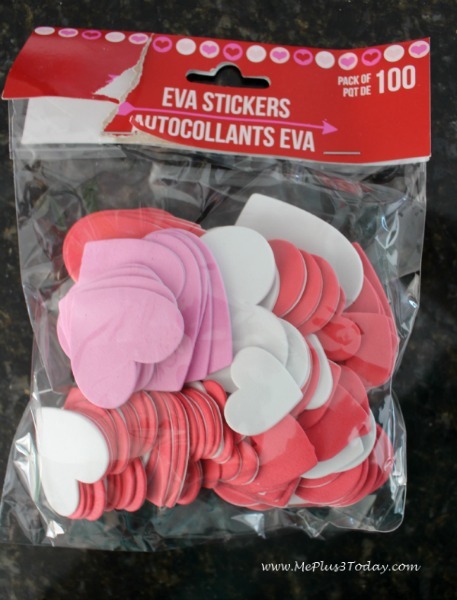 Disclosure: This Valentine’s Day Craft post contains affiliate links. I may make a small commission from purchases made via these links. Thanks! 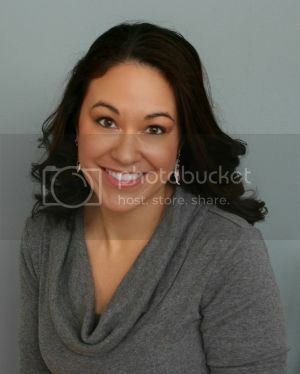 A picture of your child, with the face size about 1-1.5 inches tall. 1) I actually prepped this Valentine’s Day craft the night before! I usually hate crafts that require prep time, but it took less than 10 minutes, so it wasn’t too bad. I cut out medium sized hearts (about 4 inches tall) from pink construction paper. I also cut out smaller hearts (about 1.5-2 inches tall) from white cardstock, although we didn’t end up using them. The large pink hearts will be the love bug’s wings. I actually traced one of Will’s shoes in order to get the shape for the love bug’s body! I cut that out of red construction paper. And then I cut out just the kid’s faces from extra school pictures that I had. 2) I had the kids “embellish” the wings and the body of their love bugs just by coloring them with crayons and markers. If I would have been feeling really ambitious, I might have used glitter or something. But I was not in the mood to deal with that kind of mess! I like to keep our crafts simple, like these snowflake crowns we made! Pictured above is Violet coloring the wings and body of her love bug. She tends to color all in one spot. 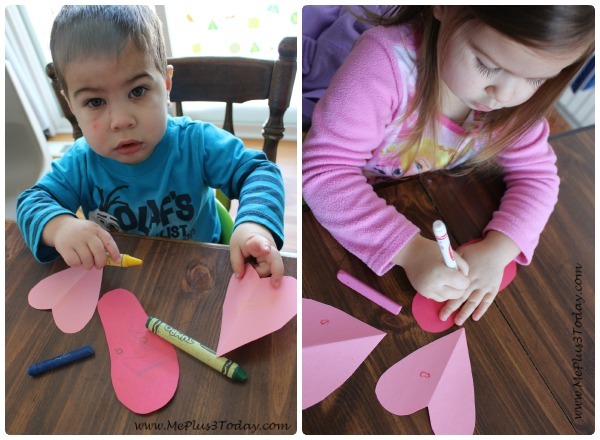 Pictured below are Will and Charlotte working on their Valentine’s Day craft! Will wasn’t really in the mood for coloring on this day, and Charlotte is tracing her hand. She likes to do that lately! 3) Next I had the kids use glue sticks to glue their faces onto their love bug’s body. I had to show them where to put it, but they did great at applying the glue and actually putting the picture in the right spot! I love the girls’ teamwork to build their love bugs! 4) We glued the heart-shaped wings on the backs of the bodies, making sure that most of the heart shape was showing so that the wings were big. 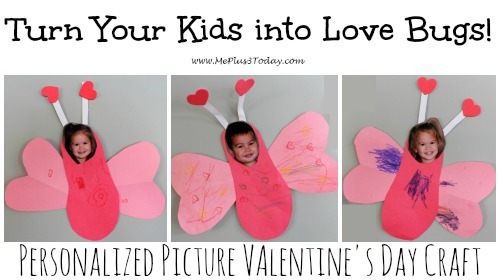 5) At the last minute, I realized our Valentine’s Day love bugs needed antennae! I quickly cut 6 little rectangular strips from some scrap paper that was laying around. 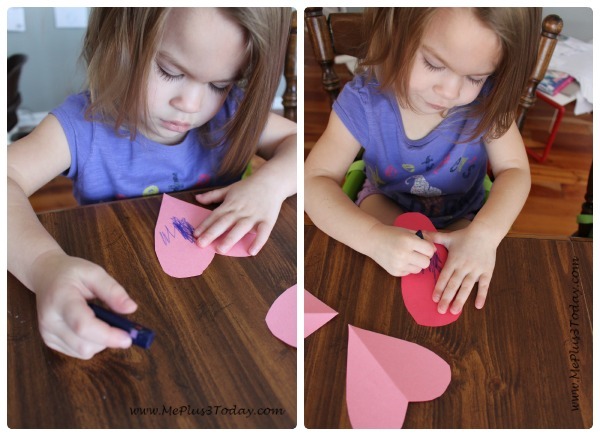 I had these heart-shaped foam stickers that we purchased from the Dollar Tree on hand, so I had the kids stick them to the end of the paper strips. I actually put the paper backer back on the backs of the stickers since the paper strips didn’t completely cover the backs. This prevented the “sticky stuff” from sticking everywhere! 6) Lastly, we glued the antennae to the backs of the love bug’s body, making sure that most of it was sticking up out of their faces. It was so cute when I was explaining the antennae to the kids. I put my hands up by the sides of my head with just my pointer fingers sticking up and wiggling to demonstrate what they were like. Watching the kids do it back to me was hilarious. They will still occasionally do it and look at me saying “Love bug! Love bug!” They just melt my heart sometimes! And then we were done! They had fun flying their love bugs around the kitchen before we hung them up on the wall. I let the kids pick where we should hang them, and they chose the very bottom of the wall, near the floor… I guess because that’s where bugs crawl? They are so silly! 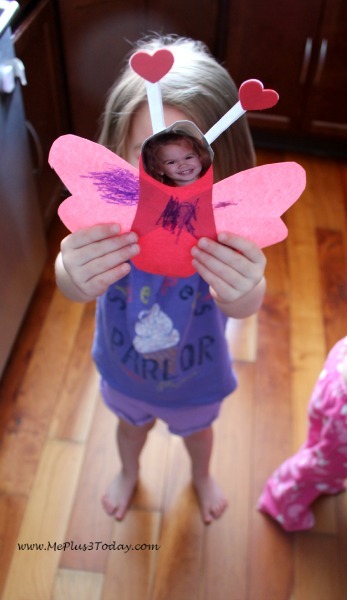 You can see that Violet is very proud of her Valentine’s Day craft! And I’m proud of her too! 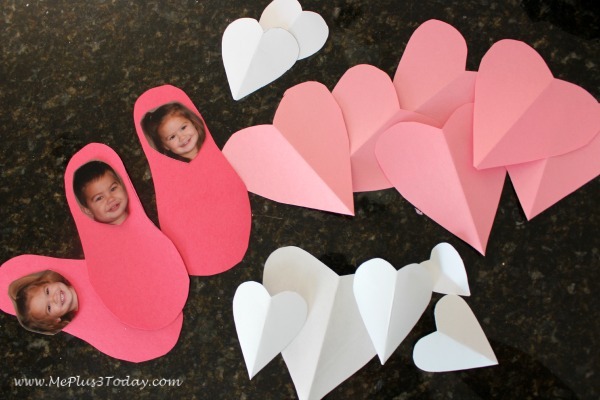 I hope you decide to give these personalized picture Valentine’s Day crafts a try! Let me know how your love bugs turn out on my Facebook page. You can tweet me too! Follow my Kids Craft Project board on Pinterest for more great ideas! Follow Sarah @ Me Plus 3 TODAY’s board Kids Craft Projects on Pinterest. Tagged Gift Idea, Holidays, Love Bugs, Valentine's Day. Bookmark the permalink. 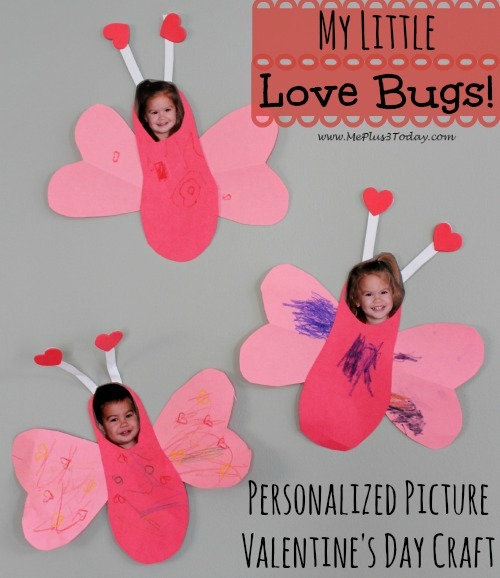 6 Comments on "Valentine’s Day Craft – Turn Kids into Love Bugs!" These are too adorable!! i love them! Definitely pinning!! !